Indoor soccer or arena soccer(known internationally as indoor football, minifootball, fast football, floorball or showball), is a game derived from association football adapted for play in a walled indoor arena. Indoor soccer, as it is most often known in the United States and Canada, was originally developed in these two countries as a way to play soccer during the winter months, when snow would make outdoor play difficult. In those countries, gymnasiums are adapted for indoor soccer play. In other countries the game is played in either indoor or outdoor arenas surrounded by walls, and is referred to by different names (such as fast football (futbol rapido) in Mexico, showbol in South America, and indoor football (futbol indoor) in Spain). Indoor soccer has different regulations from other versions of association football designed for indoor play, such as futsal and five-a-side football. Unlike futsal, which is played on wooden or ceramic surfaces, indoor soccer is played on synthetic turf (or, in the case of the British Masters Football variety, synthetic carpet). Indoor soccer courts are delimited by walls instead of lines, and there are no player throw-ins. During its existence, FIFRA organized several indoor soccer tournaments for national teams, including the Indoor Soccer World Championship. The only edition of this tournament took place in Mexico in 1997. 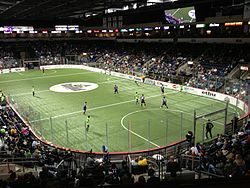 No other indoor soccer world championship was held until 2015, when the WMF organized the first WMF World Cup in the United States. The second WMF World Cup took place in Tunisia in 2017. A world cup for Under-21 players was held in Prague in 2018, with the Czech team taking the title. Star Sixes, an indoor six-a-side football tournament for national teams from around the world, was held in the O2 Arena in London in 2017. Held outside the auspices of the WMF (and with different rules), this tournament featured players which formerly participated in the association football national teams of their home countries. A total of twelve teams participated, with France winning the title. It is intended to make Star Sixes a recurring event. A second edition took place in 2019, with England winning the title. Indoor soccer is a common sport in the United States and especially Canada, with both amateur and professional leagues, due to the short season for outdoor soccer in Canada and the Northern United States, and the ubiquity of arenas built for ice hockey and basketball which can easily be converted to indoor soccer (similar reasons as to why indoor lacrosse is more popular in Canada, field lacrosse in the United States). It is especially popular in Northern Canada due to the often unplayable outdoor conditions and its appearance in the Arctic Winter Games. Indoor soccer or futbol rapido has also become a popular sport in Mexico, being included as part of the Universiada (University National Games) and the CONADEIP (Private School Tournament), in which university school teams from all over Mexico compete. In Mexico, "indoor" soccer fields are frequently built outdoors (though indoor courts are also used in some tournaments). In 2012 an eight-team indoor soccer league was launched, which consists of former professional association football players from Liga MX. ^ "PASL Commissioner Kevin Milliken Talks Ontario Fury Debut, First World Cup". PASL. 12 November 2013. Archived from the original on 8 August 2014. ^ "Gamesheet: Mexico vs USA". WMF World Cup. 29 March 2015. ^ "USA Win Inaugural WMF World Cup". Indoor Soccer News. 29 March 2015. ^ "EMF - European Minifootball Federation". eurominifootball.com. Retrieved 30 July 2012. ^ Quarstad, Brian. "USL Announces Merger with Major Indoor Soccer League". insidemnsoccer.com. Retrieved 30 July 2012.